If you already think Windows 8 is a flawed OS, Microsoft’s new 8.1 update won’t change your mind. But I've been digging into a preview release of the new system since Tuesday afternoon, and it's clear that Microsoft's course-correction efforts have paid off in loads of convenient new features. Microsoft announced the long-awaited Windows 8.1 preview at its Build 2013 developer's conference in San Francisco on Wednesday. To download the preview, you can get it from the Windows Store on your existing Windows 8 or RT device—after backing up your hardware first, and reading both this installation guide and Microsoft’s FAQ. Microsoft executives say your current apps won’t be affected by installing the preview, but some could require re-installation once Windows 8.1 is released in its final form. The download appears to be about 2.44 GB, based on a demo Microsoft showed journalists Tuesday. Microsoft also confirmed that it has “alpha code” of Microsoft Office for the Modern interface that’s due some time in the future. The preview holds few surprises for those who've been keeping track of the Windows 8.1 saga. Yes, it includes the new boot-to-desktop option, and Microsoft has re-organized the Start page to make finding apps easier. Within the desktop, the Windows flag serves as a faux Start button, although it’s really just a shortcut to the Start page. The expected personalization options are there, including dynamic desktop art as well as the ability to share a background between your desktop and Start page. But there’s also a flood of other tweaks, apps and features, making this free upgrade a tremendous value in terms of volume alone. Are new sorting options the answer to Microsoft's Start problems? Some highlights: There's a new Bing Food & Drink app that you can wave at to turn the page, Samsung Galaxy S4 style. There's direct control of 3D printers (yes, 3D printers). You can turn the PC into a Wi-Fi hotspot, and stream 1080p video via Miracast to the Xbox One. And Microsoft also confirmed that it has “alpha code” of Microsoft Office for the Modern interface that’s due some time in the future. Although Microsoft will key the Windows 8.1 release to your Microsoft ID account, it seeded the upgrade to journalists and analysts on Surface Pro loaner units. While not much grabbed me from the get-go, poking into the nooks and crannies has been rewarding. Because Windows 8.1 is a connected operating system, booting up the Surface is a rather blah experience. But after connecting your Microsoft account, enabling SkyDrive, and diving into the personalization options, Windows 8.1 comes alive. It’s just a lot harder than it could be. The Start button! It's back! Well, sort of. 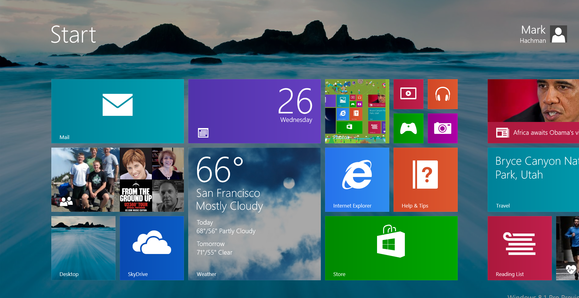 A key goal of Windows 8.1 is to offer a highly personalized experience. Indeed, one of the many additions to the Start page is the “Personalize” option under Settings. To get there, swipe in from the right, select Settings, and then “Personalize." Once you do so, you’ll have an option to add different backgrounds, with various color schemes. I’m not sure if the Surface I had simply lacked the dynamic ‘Dragon” and “Robot” backgrounds that Jensen Harris, part of the Microsoft Windows User Experience team, demonstrated for reporters Tuesday. But Windows 8.1 either synced over the new backgrounds by copying over my old background options, or the content wasn’t there. 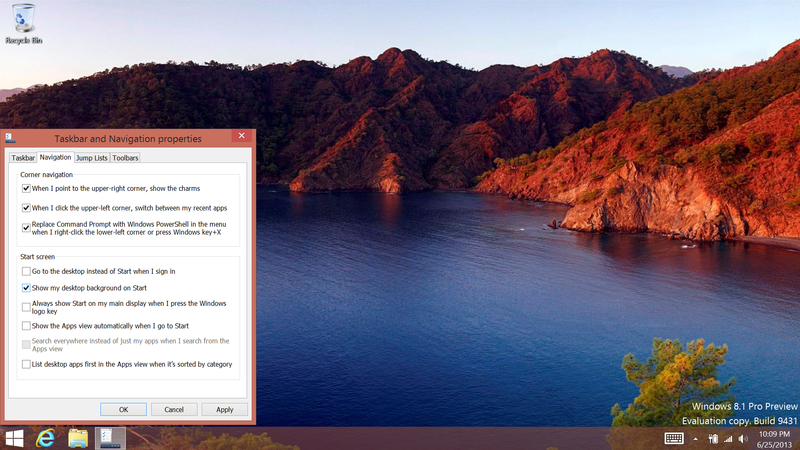 Windows 8.1 also adds the ability to share a background between the desktop and Start page. It's a pleasant feature that offers the impression that your desktop and Start page are simply two sides of the same coin. Adding this capability is harder than it looks, though: I had to manually change the desktop background, then wait for it to show up in the “Personalize” tab in the Start commands. A “sync Desktop and Start backgrounds” option would solve the problem, but it isn’t there (more on that later). Start screen backgrounds: Not as nice as the dynamic backgrounds Microsoft showed off, but they tie the Start screen and desktop together. In fact, when I turned off syncing on my personal PC tied to my Microsoft account, the beach background I had on my Windows 8.1 desktop disappeared from my Start screen, but remained as a Personalize desktop option. Clicking it didn’t work, and it remained there as an unusable choice. Another personalization feature is available via the “Change PC Settings” option: You can turn your PC into a photo frame with photos displaying on your lock screen. Unfortunately, I couldn’t get that feature to work, and it wouldn't pull my photos from SkyDrive. Windows 8.1 does offer the ability to sync apps, as well as Start screen tiles and layouts, Web browser shortcuts, mouse and printer settings, and more. For right now, however, I’m not sure the sync settings are that useful, especially between Windows 8 and Windows 8.1 devices. The "Change PC Settings" option also allows you to turn off “hot corner” access to the Charms and recent apps, eliminating one of the more confusing features of Windows 8. Part of the problem is that Microsoft has hidden its power-user options within the desktop. In Windows 8, pressing the Windows key + “X” brings up a handy menu of commands, including the Control Panel, Device Manager, Disk Manager, and others. Within 8.1, you can access that power-user menu via a “long press” of the Windows flag/Start icon. Microsoft hides some nifty features inside this menu, including Boot to Desktop. But right-clicking the taskbar at the bottom of the desktop brings up the really important stuff. A new “Navigation” tab within the Taskbar and Navigation Properties contains the boot-to-Desktop option; the option to sync the background of the desktop and Start screen; and the option to show the Apps view automatically every time you view the Start screen. These features (and others) are all incredibly useful options, but they're almost impossible to find unless you know what you’re looking for. Smart Search: the command line for Windows? 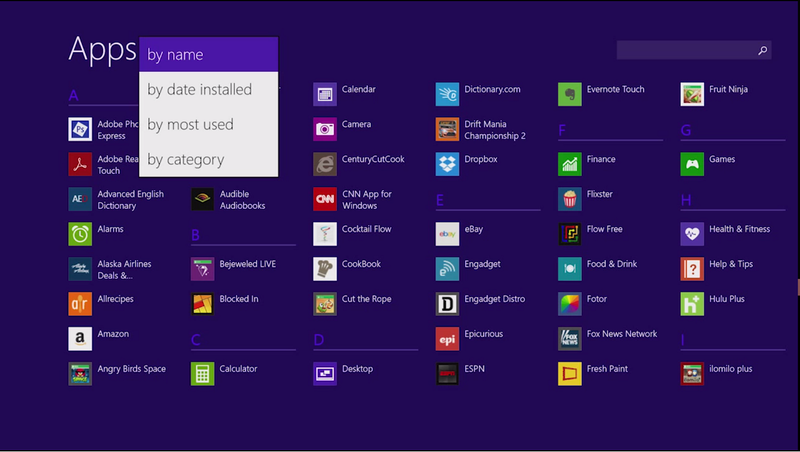 One major complaint about Windows 8 concerns finding applications: Instead of clicking though a Start menu (as in Windows 7), you have to visually search within a mass of tiles, or key in a search from the Start page. One of the ways Windows 8.1 solves this problem is by organizing your software into an “All Apps” collection that can be accessed by swiping up from the Start page. The list can be organized several different ways, including most frequently used, last accessed and, of course, alphabetically. Madonna gets the hero treatment within the new Search app, with a bio, music, videos, and a flattering picture. Microsoft has also significantly improved its search capabilities. Start typing, and a search window opens to the right, as it did in Windows 8. But the new Search capability searches the Web, your PC and SkyDrive, among other locations. Search for “Madonna,” and up pops a lovely, enormous “hero” page with the singer's biographical information and discography. (The Surface that Microsoft gave me linked the discography to Xbox Music, so I quickly switched to BB King for the rest of the night.) The amount of possible results could grow enormous, but Microsoft does a fine job of managing the output. Sadly, mail can’t be searched—yet. Xbox Music provides a free “radio station” of a particular artist or genre, no subscription needed. Microsoft executives said that it would auto-import playlists on a web page, such as the lineup of artists at a music festival, later this year. From a macroscopic level, Microsoft has also added flexibility to its Modern apps, adding the capability to “snap” up to four apps on a standard widescreen monitor. (Adding another monitor allows another four.) Only two windows—the standard for Windows 8—can be snapped on a Surface, however, due to scaling issues. I wasn’t able to test the "four-up" feature on a full-sized monitor, as I lacked a mini-DVI adapter for the Surface review unit. 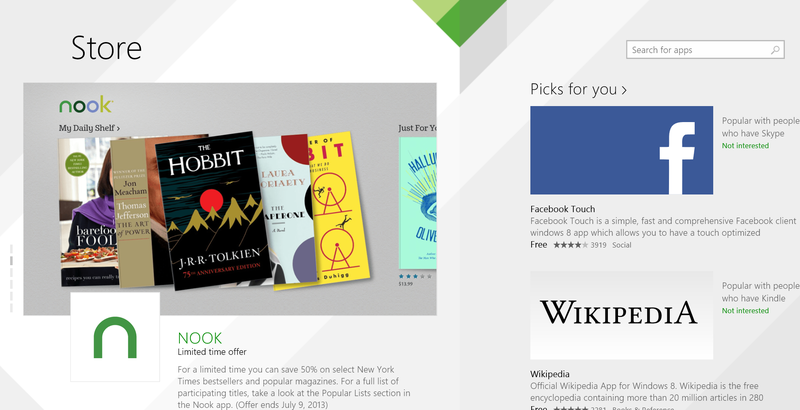 Meet Reading List, one of the new Windows 8.1 apps. On a more microscopic level, a number of apps have either been rewritten or totally added for the Windows 8.1 release. Among these is Reading List—sort of a Microsoft-branded Instapaper. If you open up a web page, then bring up the “Share” charm, you can save whatever you're reading for later. It works as you might expect, but with some limitations. First, you need to remember to click the little “air mail” icon in the upper right of the Reading List tab. Second, it only works with the Modern version of Internet Explorer, rather than the desktop version. Stories then open in IE for later reading. One of the more significant additions is Internet Explorer 11. 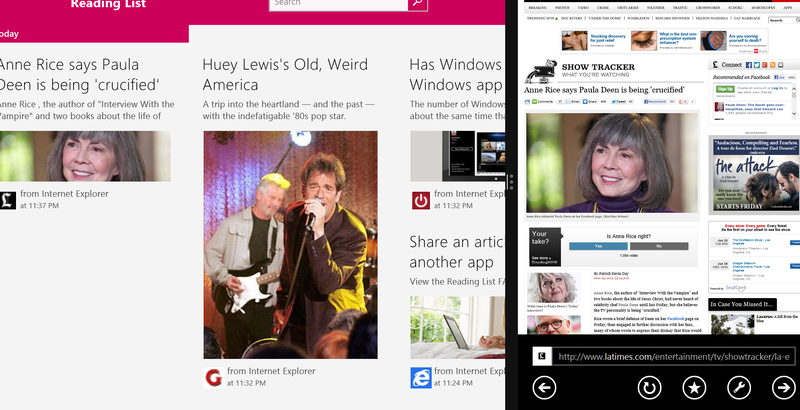 It now includes side-by-side browsing and syncing of favorites, tabs, and settings across all Windows 8.1 devices. Microsoft also says it loads pages faster. We weren’t really able to test all these capabilities (we only had one Windows 8.1 device, for example), but the browser seemed to do the job just fine. Internet Explorer 11 can also prevent extensions from launching until it has a chance to hand of the code to an anti-malware program for scanning. 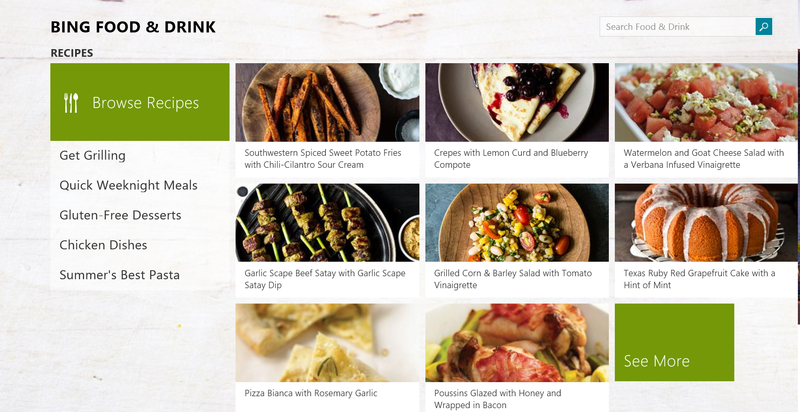 Windows 8.1’s Food & Drink app. Food & Drink is a new built-in app that includes a meal planner, a shopping list tool, and a searchable database of recipes that can be augmented with content you find online. The list of recipes isn't very remarkable, but it includes a nifty trick: You can enable a “hands-free” mode, and flip through pages just by gesturing above your device. The idea is to avoid gumming up your computer or tablet with your chicken-spattered paws, but you’ll still need several clicks to enable hands-free mode, and the Surface's webcam practically required my hand to cover its lens. Health Tracker is essentially Food & Drink for exercise. You can check out a range of exercises; monitor nutrition, diet, calories, blood pressure, and other health attributes; and examine an encyclopedia of drugs and health conditions. It’s all laid out well, and can sync with Microsoft’s HealthVault online record storage. 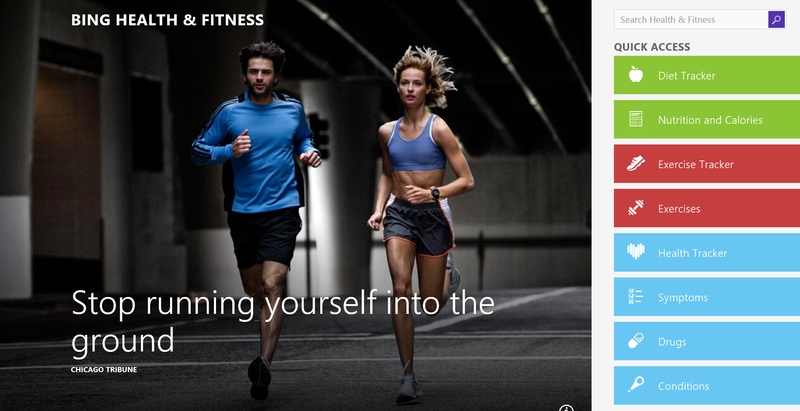 The new Health Tracker app from Bing offers a wide variety of health info. Microsoft also promised that a new version of Skype will alert users to incoming calls via a popup message on the lock screen, and then allow you to begin talking immediately. I created a test account on a nearby Windows 8 machine, then installed Skype on the Surface and called myself. I was able to see the alert, but I had to log in as normal to begin talking. Clicking on the alert didn’t work. SkyDrive is also supposed to gain photo editing capabilities, allowing you to simply swipe your screen for a range of photo filters and editing features. For some reason, this didn’t work for me, and the seemingly related Photos app didn’t have this capability either. Mail, another app that Microsoft’s Harris described as updated, also seemed to be exactly the same in the Windows 8.1 build loaded into my Surface Pro loaner unit. Nonetheless, when all is said and done, Mail’s inbox will allow you to flag and sort messages by sender, and social updates from Twitter and Facebook will be able to be separated into their own folders, Harris promised. In addition, Windows 8.1 boasts a new Voice Recorder app, a new Alarms app, and a spiffy new Calculator app. (Note that there are both desktop and Modern versions of Calculator, if you want to test one against the other.) Microsoft promised that Sports, News, Weather, Finance, and Travel have also been updated for Windows 8.1, but I didn't have time to dig into all the apps before posting this article. One subtle change in Windows 8.1 is the elimination of the little number at the bottom of the Windows Store icon. That’s because apps now auto-update in the background. This sounds good on paper, but comes with a caveat: According to Microsoft’s Ted Dworkin, partner director of program management for the Windows Store, apps won’t necessarily alert you if they’re updated and their access policies change. This means that if an app wants more data, Microsoft will quietly grant permission unless certain undisclosed permissions are asked for, triggering a user notification. The revamped Windows Store now devotes the first screen to a single app. Within the Windows Store app itself, look for the first “page” of tiles to go away. Instead, Microsoft is curating apps, pushing forward a single software title that it thinks most users will like. There's also a special selection culled for individual users, based on their preferences. Microsoft will also now allow in-app purchases for special costumes and other consumables in games, and will offer stored-value options, allowing you to carry a balance of dollars, yen, euro, or other currency from which to buy apps, movies, music, and so on. In Windows 8.1, you will also be able to install apps on an unlimited number of Windows devices, but Microsoft will monitor user activity to make sure apps aren’t copied across, say, an entire dormitory’s worth of hardware. If you read our earlier report on Windows 8.1 for businesses, you’ll get a good grasp of what Microsoft intends for the enterprise features of the new OS.